Romário de Souza was born on 29th, January, 1966 to parents Edevair de Souza Faria and Manuela ladislau Faria in the city of Rio de Janeiro, Brazil. Despite the fact they were not financially well-off, Romário’s father encouraged him to pursue his dream of becoming a professional footballer. As a child, Romário began playing for Olaria football club in his local town. After a short spell, the club’s management was impressed by the young man’s skills and decided to offer him a contract when he was only 13 years. With hard work and determination, Romário was able develop rather quickly as a player and came into prominence when he scored 4 goals in a match against Vasco da Gama. As a result, the losing team’s management offered him a contract in 1985. At the youth team level, Romário performed very well for Vasco da Gama. He managed to win a couple of titles for the team and was later on selected to be part of the Brazilian national team. He was fortunate enough to represent his country at the 1988 Seoul Olympics and emerged as the top scorer of the tournament. Romários team managed to secure a silver medal. After just two years, Romário was again instrumental in his team clinching the Copa América title as he managed to score the winning goal in the final. Following his astounding performance for the Brazilian national team, Romário was secured by giant Dutch club PSV Eindhoven in 1988. It is during his time in Netherlands that Romário come into full-circle. During his five years at the club, Romário netted a whopping 125 goals and led his club to a Cup championship and three league titles. 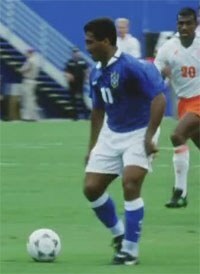 During the 1990 World Cup final held in Italy, Romário was only able to play a minor role in the competition due poor match fitness after just recovering from a broken leg. But Romário redeemed himself four years later in the USA World Cup, where he netted five goals and could arguably been the biggest star of the tournament in which Brazil collected their record breaking 4th World Cup title. In hindsight Romário was one of the main figures in the Brazilian team, but it was not far away that he had been overlooked due to a schism with the coach Parreira. The world could witness the finesses of Romário. His astonished ball control and ability with a Maradona-like physiognomy and body movement. He had a pattnetly way of going through a defender with the eright foot rolling the boll to the left of his body's direction. In comparison to another South American striker, Gabriel Batistuta, Romário wasn’t using much power to score, instead roll the ball in with a light touch. After his spell at PSV Eindhoven, Romário made a switch to Spanish football powerhouse FC Barcelona in 1993. Despite all the big names in the club, he managed to become an integral part of the squad, which later came to be known as the "'Dream Team". Romário was an essential goal scorer during his duration at the club. He managed to net 46 goals in 34 appearances and helped Barcelona to clinch a league title. After two years, Romário and the club split ways. In 1995, Romário made a move to Brazilian Club Flamengo. During his five year stay at the club, he had two rather unsuccessful spells in Spain with FC Valencia. Yet, things were a bit different at home. Two years after signing for the club, Romário once again assisted Brazil in securing another Copa América title by forming a lethal striking force with his teammate Ronaldo. Unfortunately, the following year, Romário was not selected for the national squad bound for the World Cup in France due to the fact that he was unfit for play. In the year 2000, Romário moved to Brazilian club Vasco da Game where it all started for him and managed to lead them to the Brazilian league title and 'Copa Merscour’. Romário netted 41 goals in a mere 46 appearances for the club. Later on Romário moved to Fluminense and after that a short and unhappy spell in Qatar at Al Sadd. In 2005, Romário left Al Sadd and returned to Vasco Da Gama where he together with Edmundo would embody an exciting partnership. Romário managed to net 22 goals during the season and become the top scorer. Later on, he had a short spell Miami FC and also played a few matches for Australian side Adelaide United FC. Romário served as a player-manager for his former club Vasco da Game but was sacked a while after due to disagreements with the management of the club. He also tested positive for a banned substance which brought an end to his playing career. Throughout his career, Romário won numerous awards, one of the most notable being the 'FIFA Player of Year Silver Award’ that he clinched in 1994. Romário got married to Isabelle Bittencourt back in 2002 and they have two children, Isabellinha and Romarinho Faria.